Maybe you’ve already noticed. Perhaps you haven’t. 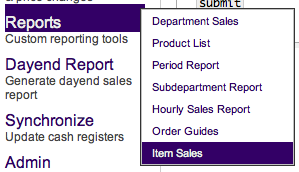 There’s a new report under the reports menu in Fannie. It’s called Item Sales, and this one can tell you lots of hopefully useful information about individual item sales. Produce, frozen, alcohol, whatevs. For your enjoyment i created a screencast showing you how you can use the Item Sales report. You can watch it here. Hope you find the video and the reporting tool helpful and fun. PS: A screencast is a video and audio recording of whats going on on my screen and what im saying. Pretty neat training tool. Let me know if they’re helpful or not. 4 comments to [Fannie] Look! It’s a new report. joel! that video was amazing! i love it! Dude, you fuking rock my world. Can I have your child. Is there anychance of setting up a few computer camera’s in the walk-in, the produce desk and on the rack ? Then I can work from home more ?…Thankyou so much Joel, I luv it, and the video thing is awesome, I would luv to get a lesson in how to use it, and it’s limitations etc…YES. joel, i found the report out of curiosity, and shared it with paul h and andrea. it was soooooooooooooooo grand! Thanks y’all for the feedback. I’m glad this is helpful for some.